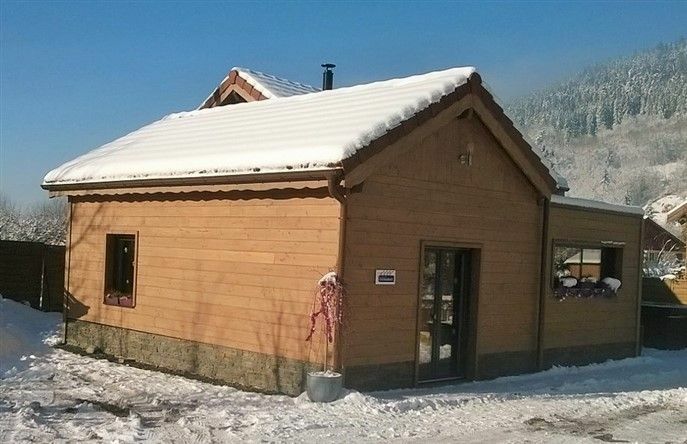 Common contemporary Sapois Chalet of 120 m2 Labeled 4 KEY at Clévacances, Therapeutic Spa 7 places PRIVATE INCLUDED, 1200 m2 of enclosed land with electric gate, walk to start the cascade of Bouchut. Underfloor heating and convectors upstairs. 4 themed rooms equipped with comfortable desk, closet and TV. Beds made on arrival (linen hotel quality) Integrated Kitchen, Living on the living room with wood stove, TV 139 cm and home cinema. 2 bathrooms with walk in shower, 2 toilets, 1 independent. Wood terrace, garden furniture and deckchairs. Ski room and bicycles outside locked. Many facilities: washing machine, dryer, dry towel, dishwasher, safe, complete baby equipment (ready pram stroller terrain, hiking BB door), library, etc ... The rate includes water, complete linen (beds made on arrival and towels + bathrobe), household products, a large wooden box. Electricity to be paid in addition by EDF price-peak / peak hours according to meter. Pets not allowed imperative! 400 euros 2 nights weekend until Sunday late afternoon. From the moment you arrive , you get a very warm and welcoming chalet. The interior is decorated to high standards and beautiful features with vaulted ceilings, all the bedrooms have their own theme and very comfortable. Very well equipped kitchen with everything you could possibly need. Under floor heating keeps the chalet cosy and warm and also a large fire to give even more warmth if necessary. Lovely large hot tub to relax after skiing is just a perfect touch. Skiing at Gérardmer is only 20 minuets away from door to slopes by car and very easy to reach . Communication is very good with the owner and speaks English which breaks down any language barriers you may have . Would like say many thanks again and would love to return very soon not only in winter but summer too. Nous venons de rentrer et déjà le manque est là. C'est le genre d'endroit où on se sent de suite chez soi. l'intérieur est cosy et chaleureux, les hôtes sont charmants et très accueillants, et la semaine passe trop vite. A noter, un très bon équipement en matériel et une excellente literie. vivement l'année prochaine ... ou avant peu être. Très beau chalet, très calme, idéal pour ce ressourcer. Belle location dans jolie région. Tout confort. Chalet très agréable et calme assuré. Very friendly owner and very comfortabel house. The large jacuzzi, hotel grade beds and nice garden made our cycling holiday perfect. Would recommend to anyone. Farm products: Farm Lejol (5 min) sausages, smoked, Munster, etc ..